An object is a code representation of something that exists in the real world or in program space. You cannot touch a program object with your hands. It exists as lines of code that are treated as a single unit. In the physical world away from computers, a tree is an object, a lorry is an object, a book is an object, a caterpillar is an object, and so on. An object has attributes (properties) that describe things about the object, and it has methods that specify the actions the object can perform. We can represent any of these objects and their attributes and methods using lines of program code. The more lines we write, the more detailed the object. Suppose we want to represent a real-world object: a game piece. A plastic game piece the means business. Let’s see how we can represent its greatness in program code. Let’s give this piece a personality by describing it. 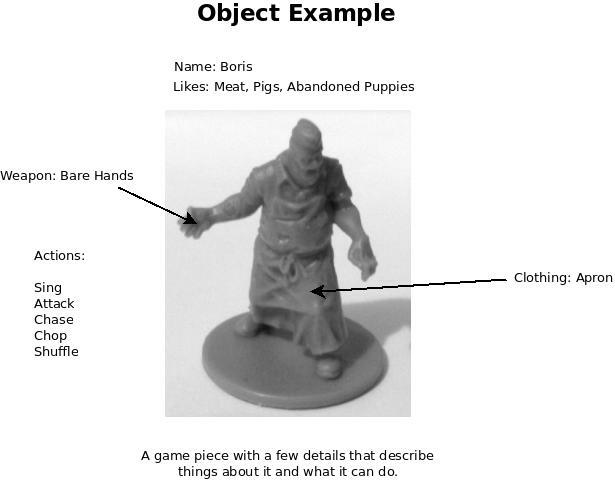 Details about the Boris object. The template, or blueprint, of an object is called a class, and we create an object from a class. We do not use a class directly. Instead, we create an object from a class. To illustrate this concept, compare a blueprint of a house with a real house. The blueprint is not the actual house. It only describes the house so we can build one. We cannot live in a blueprint. It is a sheet of paper that gives the dimensions and other details needed to construct the house. The house constructed from the blueprint is the object. It has a foundation, walls, a roof, and we can step inside and live in one. The blueprint is the class, and the house created from the blueprint is the object. Class diagram. We create an object from the class. 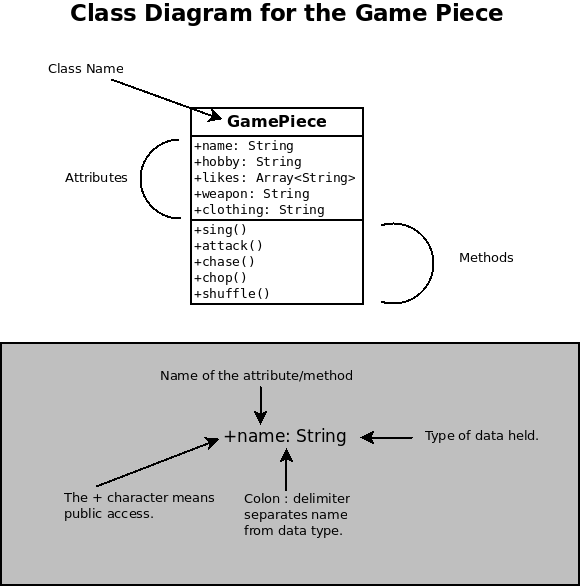 Notice that there are no details in the class diagram. It has no name. No weapon is listed. We only see generic placeholders telling what data types to use. The values for those data types are not specified in the class. When we instantiate an object, we fill in the blanks with details. An object is instantiated from a class. The class only says that there is a name and it holds a String data type. 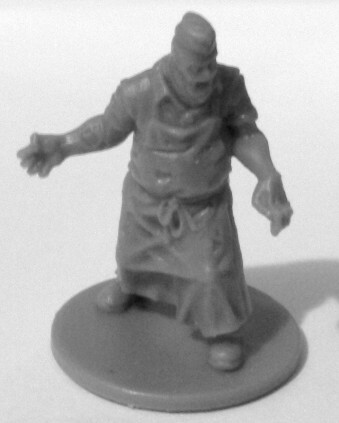 The object contains the individual details, such a the name “Boris” and he wears an apron. 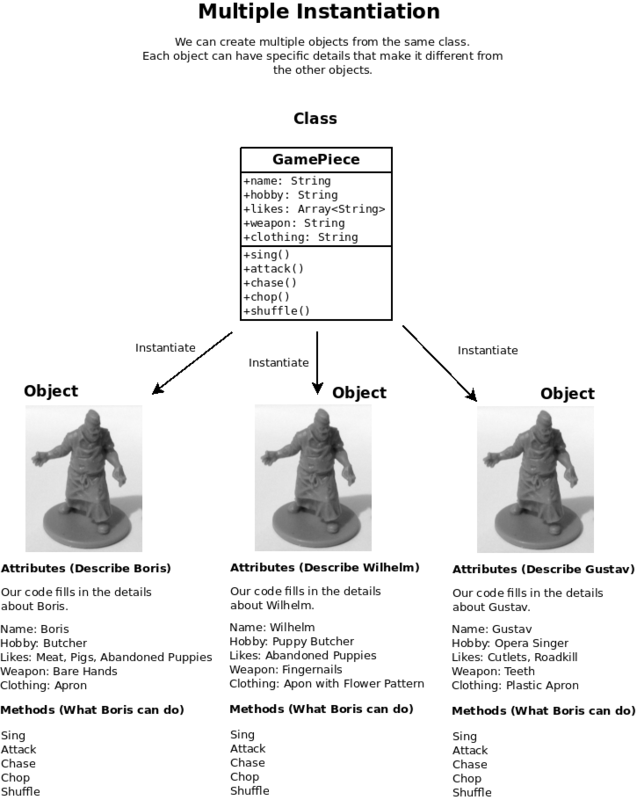 Since the class is a faceless template, we can create many, many specific objects from the same generic class. This is one of the core concepts behind object-oriented programming. We can create several objects from the same class. Three objects created from one class. Each object is given a different name, hobby, likes, weapon, and clothing. Classes and objects can become lengthy topics, so do not be concerned if you do not fully grasp the idea about Strings, data types, classes, and objects at this point. We will learn the code in a later lesson. In the past lessons, we have already been using two important objects: the window object and the document object. Just like Boris, the window and document objects possess attributes and methods that your code can access in order to manipulate the browser and HTML elements on the web page. The window object represents the active window or tab of the web browser that is displaying the current page. When using tabbed browsing, each tab would be its own window object. 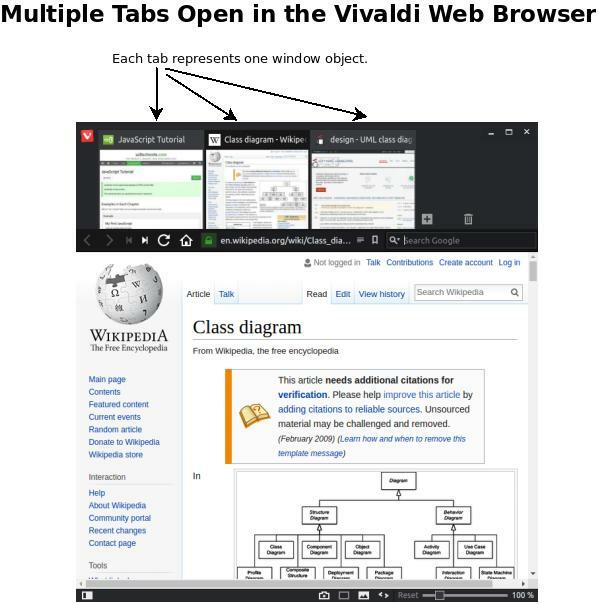 Vivaldi web browser. Each tab in this example is one window object that contains one document object. HTML frames may be represented as additional window objects. So, what can we do with the window object if it contains its own set of properties and methods? The alert() method is a part of the window object. Each time we call alert to display a modal popup dialog in the browser, we are actually calling window.alert(). 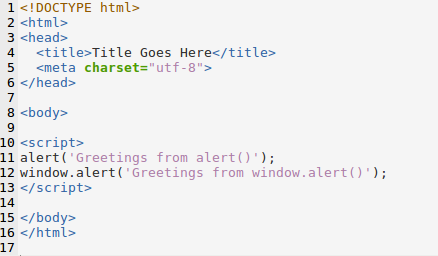 alert() and window.alert() produce the same result because alert is a method of the window object. alert() by itself is a shortcut. Truncated output. Window properties and methods are in bold due to the strong element. We can gather a wealth of information about the current window by reading the window object. Screen location, window dimensions in pixels, current URL, and more are a few examples of what is possible. 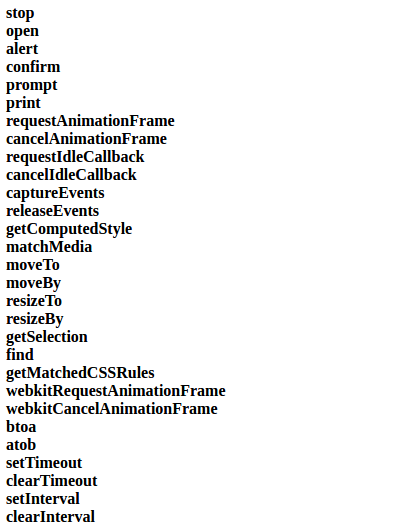 There is no standard among web browsers, so not all support exactly the same properties and methods. Your code might need to perform a test to determine if a required property or method is supported by a specific browser. The window object provides information about and access to the display device. The document object represents the current web page. For example, if we wish to get the text located within the <title></title> HTML tags of the HTML file, we can read document.title. Vivaldi output. The document (web page) shows the title text This is text within the title. Boo! to the left, and the console in the developer tools show the same title to the right along with the line number on which the console.log statement was encountered. When we use document.write, we are calling the write method that is built into the document object. 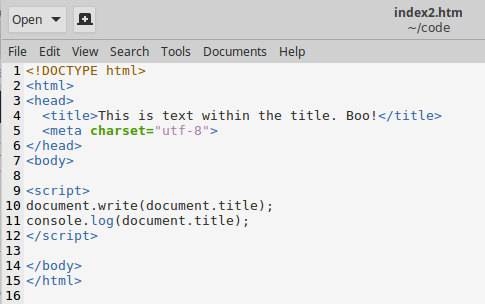 The write() method outputs its given text to the web page where it is encountered. Yes. Just like we can list the properties and methods of the window object, we can do the same with the document object. Listing document object properties and methods. Vivaldi output. Truncated listing. 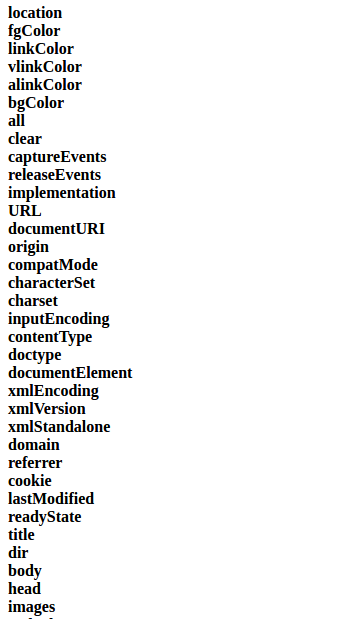 Many document properties and methods exist. There are too many properties and methods available with the window and document objects too describe them all here. For more information regarding details and implementation, have a look at w3schools.com as a beginning. A property is something about the object (title, URL, location). A method is what the object can do (alert, write, clear). An event is what happens in response to an action. An event happens when a user clicks a link or clicks the submit button on a form. An event is when a page is finished loading. An event is a key pressed on the keyboard. An event is when the mouse hovers over an image. Many events exist, and these are a few examples. Since a web page can be thought of as a GUI (graphical user interface) the user interacts with, events can be handled as a response to user activities or other page events. This entry was posted on July 31, 2017, 3:23 PM and is filed under Lessons. You can follow any responses to this entry through RSS 2.0. You can leave a response, or trackback from your own site.